Flipping the classroom has transformed our teaching practice. We no longer stand in front of our students and talk at them for 30 to 60 minutes at a time. This radical change has allowed us to take on a different role with our students. Both of us taught for many years using a lecture format. We were both good teachers. In fact, Jonathan received the Presidential Award for Excellence in Math and Science Teaching as a lecturer, and Aaron received the same award under the flipped model. As we look back, however, we realize we could never go back to teaching in the traditional manner. The flipped classroom has changed not just our own classrooms. Teachers from around the world have adopted the model and are using it to teach classes in all curriculum areas to elementary, middle, and high school students as well as adults. We have seen how flipping your classroom can change kids' lives. 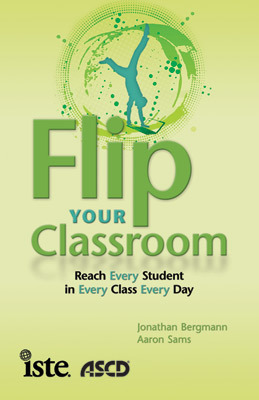 In this chapter, we want to highlight why you should consider flipping your classroom. I can't think of a reason to willingly go back to the traditional lecture method. I have to teach so many different courses this year that I have not been able to use the video/mastery method in my forensics course. I hate teaching it, because I now hate lecturing. Today's students grew up with Internet access, YouTube, Facebook, MySpace, and a host of other digital resources. They can typically be found doing their math homework while texting their friends, IMing on Facebook, and listening to music all at the same time. Many of these students report that when they come to school, they have to turn off and dumb down because their schools ban cell phones, iPods, and any other digital devices. The sad thing is that most students are carrying in their pockets a more powerful computing device than the vast majority of computers in our underfunded schools—and we don't allow them to use it. When we present the flipped classroom to educators, we usually get an ooh-ahh reaction from our audiences, which are primarily made up of adults who did not grow up with the always-on digital world. When we began flipping, we were surprised at our students' lack of amazement. After about two weeks of watching the videos, they had settled into learning, and the "wow" factor was gone. These students understand digital learning. To them, all we are doing is speaking their language. Don't get us wrong—we are not saying they don't appreciate learning this way. But instruction via video is not a big deal for today's students. One concern we have heard from adults is that we're increasing screen time in front of a computer, which aggravates the disconnect many adults feel with today's youth. To that we say that we are infiltrating the video/digital culture instead of fighting it. Isn't it about time we embraced digital learning and used it to help our students learn, instead of telling them they can't learn with today's tools? It seems preposterous to us that schools have not embraced this change. When you walk into our classrooms, you will see students engaged in a variety of activities using different digital devices. Students are working on our (obsolete) class computers, they are using their iPods, they are working together, they are experimenting, and they are interacting with their teacher. We encourage our students to bring in their own electronic equipment because, frankly, it is better than our school's antiquated technology. Because some guys who got a book published told you to. We're flattered that you are interested in what we have to say, but do not adopt any teaching strategy without thinking it through first. Because you think it will create a 21st-century classroom. Pedagogy should always drive technology, never the other way around. Because you think you will become cutting edge. Flipping does not necessarily use the latest technology. Because you think flipping your classroom exempts you from being a good teacher. Teaching is much more than good content delivery. Because you think it will make your job easier. Flipping will not make your job any easier. Students today are busy, busy, busy. Many are overprogrammed, going from one event to the next. Our students appreciate the flexibility of the flipped classroom. Because the main content is delivered via online videos, students can choose to work ahead. Jonathan had a student who was a competitive gymnast who regularly traveled to out-of-state competitions. When she was gone, she missed most of the instruction in her classes. But because she was in a flipped classroom for science, she did not miss any of the content in that class. She chose to work ahead when competitions were coming up. When she returned, she had at least one class she didn't have to worry about. Aaron had a student who is heavily involved in student council. This year, when homecoming was approaching, she worked ahead. She got one week ahead in his class, and when homecoming week happened, she used Aaron's class time to work on homecoming activities. These two students have not just learned how to "work the system"—they are learning valuable life lessons in managing their time. This would not work in a traditional classroom, but flipping the classroom provides a great deal of flexibility to help students with their busy lives. We have students that travel very far to get to school (some up to an hour and a half on the subway each way) and this allows them to work on chemistry whenever they want. Many of my students also participate in multiple sports, so athletes are not missing class anymore, which helps everyone in the long run. When we taught in the traditional manner, the students who tended to get most of our attention were the best and brightest—students who would raise their hands first and ask great questions. In the meantime, the rest of the students would passively listen to the conversation we had with the inquisitive students. But since our introduction of the flipped model, our role has changed; we spend most of our class walking around helping the students who struggle most. We think this may be the single most important reason students thrive in the flipped model. This is not to say that we ignore our top students. But the majority of our attention no longer goes to them. Now it is directed to the students who need the most help. Our special education teachers love this model as well. Because all the direct instruction is recorded, students with special needs can watch the videos as many times as they need to learn the material. No more frantically trying to copy down notes with the hope that they'll understand them later. Instead, students can pause their teacher, rewind their teacher, and make sure they actually learn the important concepts. Some of the students that have struggled in the past (according to their parents) are doing much better because of my ability to work with them more one-on-one in class, helping with objectives they are having trouble with. As educators, we usually have a specific curriculum we need to cover in our courses. Students are expected to learn a given body of knowledge, and most of the time we hope that they understand our presentations. However, even the best presenters and lecturers have students who fall behind and don't understand or learn all that is required. When we flipped the classroom, we gave the students control of the remote. Giving students the ability to pause their teachers is truly revolutionary. Jonathan's daughter was in one of his classes, and while Jonathan observed her watching one of the videos at home, she suddenly burst out and said, "I love these videos." He asked her why. She said, "I can pause you!" Pausing is a powerful feature for a number of reasons. Making students all sit in tidy rows and listen to their teacher eloquently explain his or her area of expertise is not always an effective means of communicating to them. We often move too fast for some students and too slowly for others. Our quick learners understand immediately and get bored waiting, while our struggling students take more time to process. Inevitably, when we click the arrow to move to the next slide, a small group of students scream and shout asking to go back to the previous slide. When we give students the ability to pause their teachers, they have the chance to process at the speed that is appropriate for them. We especially encourage students who process more slowly to use the rewind button so they can hear us explain something more than one time. If they still don't understand, we will work with them individually or in small groups in the classroom. On the other end, we have students who are often bored because the teacher is going too slowly for them. These students appreciate the pause function for different reasons. These typically are our busiest students, involved in myriad activities and sports. Giving them the ability to pause helps these students with time management. Jonathan's daughter was one of these students, and she liked the pause button so she could break up the lesson into shorter segments and learn on her own schedule. We even have had a few students who watch our videos at double speed. These students are able to process our instruction faster than most, and though our voices sound as if we have been inhaling helium, they find this to be a better use of their time. A statement we frequently hear goes something like this: "This is a great method for online teaching, but I don't want to replace my classroom with online courses." Though flipping certainly has great potential to change online education, the purpose of this book is not to promote the benefits of such education. We are both classroom teachers who see our students every day. Most students today still come to a brick-and-mortar school where they see both their teachers and their peers. We believe that flipping allows teachers to leverage technology to increase interaction with students. We must be clear, however. We are not advocating the replacement of classrooms and classroom teachers with online instruction. In fact, we strongly believe that flipping the classroom creates an ideal merger of online and face-to-face instruction that is becoming known as a "blended" classroom. We often conduct minilectures with groups of students who are struggling with the same content. The beauty of these minilectures is we are delivering just-in-time instruction when the students are ready for learning. Teachers play a vital role in the lives of their students. They are mentors, friends, neighbors, and experts. Having face-to-face interaction with teachers is an invaluable experience for students. I wanted to thank you and Aaron for turning me on to the flipped classroom. I was observed by one of the assistant principals and he loved the idea so much he went to the principal later that day and told him everything I was doing. He said that every administrator should see this model and I seem to be the only one implementing all aspects of the philosophy of the school. He wants me to conduct a professional development workshop on it for next year so more teachers can start doing this. So, being a nontenured teacher in a district in a budget crisis, I think you helped me secure a job for life. Thank you so much for the work you two have done and how you have inspired me to take my teaching to the next level. One day I will have to make it out to Colorado to thank you in person. We as teachers are at school not only to teach content, but also to inspire, to encourage, to listen, and to provide a vision for our students. This happens in the context of relationships. We have always believed that a good teacher builds relationships with students. Students need positive adult role models in their lives. We hope we can be such role models. We developed these relationships before we flipped the classroom, but flipping allows us to build better relationships with our students. This is due to the increased teacher–student interaction. The year we started flipping, we encouraged students to interact with us via text messaging. Most of the time the content of these text messages is along the lines of "How do I get help on problem X?" or "What is the benchmark for this coming week?" Because we make the instructional videos together, most of our students do not think of Jonathan or Aaron as their teacher—they think of both of us as their teachers. Naturally, some students connect better with Aaron and some better with Jonathan. One day one of Aaron's students started texting Jonathan, and at first, the texts were all about science. Soon the tone of the texts changed. Jonathan realized this student was calling out for help and referred him to our counseling staff. As it turned out, this student had been kicked out of his house and was going through some intense personal issues. Though flipping didn't create this relationship, it helped create a positive environment where the struggling student could interact with an adult, and this student got the help he needed. One of the greatest benefits of flipping is that overall interaction increases: teacher-to-student, and student-to-student. Because the role of the teacher has changed from presenter of content to learning coach, we spend our time talking to kids. We are answering questions, working with small groups, and guiding the learning of each student individually. When students are working on an assignment and we notice that several of them are struggling with the same thing, we spontaneously organize these students into a tutorial group. Because the role of the teacher has changed to more of a tutor than a deliverer of content, we have the privilege of observing as students interact with each other. As we roam around the class, we notice the students developing their own collaborative groups. Students are helping each other learn instead of relying on the teacher as the sole disseminator of knowledge. It is truly magical to observe. We are often in awe of how well our students work together and learn from each other. Some might ask how we developed a culture of learning. We think the key is for students to identify learning as their goal, instead of striving for the completion of assignments. We have purposely tried to make our classes places where students carry out meaningful activities instead of completing busywork. When we respect our students in this way, they usually respond. They begin to realize—and for some it takes time—that we are here to guide them in their learning instead of being authoritative pedagogues. Our goal is for them to be the best learners possible, and to truly understand the content in our classes. When our students grasp the concept that we are on their side, they respond by doing their best. One of the struggles in today's schools is accommodating a vast range of abilities in each class. We have everyone from students who excel, to average students, to students who struggle with our content, to students who cannot read. Flipping the class showed us just how needy many of our students were and how powerful the flipped classroom is in reaching students all along this broad range of abilities. Because the majority of our time is used to walk around the room and help students, we can personalize the learning of all. For our students who quickly understand the content, we have found that if they can prove to us their understanding of a particular objective, we will cut down on the number of problems they need to do. Think of these as individual contracts with each student, where the student has to prove understanding. These students appreciate this because they realize we are not interested in busywork, but rather learning. For our students who struggle, we look for key understanding. We realize that our course is hard for many students and that learning doesn't come easily for all. For these students, we often modify their work on the fly by asking them to complete only key problems instead of all of them. This way our students who struggle will learn the essential objectives and not get bogged down with some of the more advanced topics that may just confuse them. During my time in undergrad and graduate school, I heard about how students do not all learn the same way, or at the same pace. These classes introduced the concept of a differentiated classroom, but I never knew how I could actually do that when there was only one of me, and 25–30 students in the class needing me to teach 12 different lessons to them. When I heard about creating instructional video clips, I finally realized that this is what I need in order to be able to create 25 copies of myself … which would allow kids the freedom to speed up, or slow down, as needed. I also was incredibly frustrated with students taking quizzes and tests unprepared, doing poorly, and then we would move on—regardless of performance. Now I can use classroom time to address student questions and review problems that they are frequently missing. Under a traditional model of teaching, we had students who consistently did not pay attention in class. These students were often a distraction to the rest of the class and negatively affected everybody else's learning. They were often either bored or just simply unruly. When we flipped the classroom, we discovered something amazing. Because we were not just standing and talking at kids, many of the classroom management problems evaporated. Students who needed an audience no longer had one. Because class time is primarily used for students to either do hands-on activities or work in small groups, those students who were typically a distraction become a nonissue. They either did not have an audience or they were no longer bored and were willing to dive into the learning. Don't get us wrong. We still have to redirect students. We still have students who underperform. But so many of the bigger classroom management issues have simply disappeared. We both remember years of sitting in parent conferences, where parents would often ask us how their son or daughter behaved in class. What they were really asking was, "Does my child sit quietly, act respectfully, raise his or her hand, and not disturb other students?" These skills are certainly good for all to learn—but when we first started flipping the classroom, we struggled to answer this question. You see, the question is a nonissue in our classroom. Because students are coming with the primary focus on learning, there are two real questions now: Is each student learning? If not, what can we do to help them learn? These are much more profound questions, and when we discuss them with parents, we move the focus to a place that will help parents understand how their students can become better learners. There are myriad reasons why a student may not be learning well. The student may have some missing background knowledge. The student may have personal issues that interfere with learning. Or the student may be more concerned with "playing school" than actually learning. When we (the parents and teachers) can diagnose why the child is not learning, we create a powerful moment where the necessary interventions can be implemented. A surprising thing happened when we started talking to parents during parent teacher conferences. Many of them told us they loved our videos. We then asked, "You watch our videos?" As it turns out, many of them were watching right alongside their children and learning science. This leads to interesting discussions between students and parents about the content of our lessons. This has been echoed across the country as other teachers have adopted our model. They have told us similar stories of educating their parent community. At a conference we attended a few years ago, one of the keynote speakers was a kindergarten teacher who told us this story. She taught in an ethnically diverse school that had many new English-language learners. One of the key ingredients in becoming a good reader is to be read to. She was awarded a grant for some iPod Nanos on which she recorded herself, and others, reading books to her students. The ELL students would then take the iPod Nanos home with the corresponding book and would listen to the story read to them. As the iPods were continually being used by students she started noticing they were coming back to her with the batteries almost drained. She knew how long the batteries would last and expressed her puzzlement with her students. When parent-teacher conferences occurred, one mother told her she was sorry for draining the batteries of the iPod. The mother then told this teacher that not only was she listening to the stories, but so were the grandmother, the aunt, and the whole extended family. The teacher's audio files were educating many more people than she ever expected. I have had very positive feedback from parents. Flipping the classroom has enabled parents to help their children because the parents are watching the videos too. A few of them thought that I was no longer teaching, and it took a bit to dispel this notion, but then they began to see how much more I was working one-on-one with their children with this method. In this age where a segment of our communities distrust the educational establishment, flipping opens the doors to our classrooms and allows the public in. Our videos are posted on the Internet, and our students' parents and others have free access to them. Instead of wondering what their students are being exposed to in the classroom, parents can find our lessons in just a few clicks. Like it or not, schools are competing for students. Our school loses some students to neighboring schools for a variety of reasons. Much of our loss has been because parents incorrectly perceive our school to be less academic than nearby schools. Posting our videos and opening our instructional practices to the public has brought some of these students back to our school. We teach in a semirural school where it is hard to obtain qualified substitute teachers. We especially have a hard time getting qualified teachers to walk into a chemistry class. When we first started recording our lessons and posting the videos online, we simply recorded our lessons live in front of our students. It then dawned on us that we could prerecord a lesson for our students ahead of time when we knew we were going to be gone. Jonathan was headed to a wedding out of town and thought he would try this out. He sat down in front of his computer and recorded the lesson he would normally have given. The substitute plan was simply to turn on the LCD projector, pull up the video file, and press Play. Students took notes as if he were there in class. This way his students didn't miss a beat. They got the same lesson on the right day. Students reported how almost eerie it was to hear Jonathan's voice without him being present in the class. This method is being used across the country. An elementary teacher in our district, when gone, prerecords his lessons for his students. Doing so ensures that students are taught the way he wants them to be taught, and he does not have to reteach on his return. The substitutes appreciate this method of teaching because students are getting just what the teacher wants. We even know of science teachers across the country using our videos as the substitute plans when they are gone. This chapter has been a bit awkward for us to write because we no longer just flip our classrooms. Instead we are using the flipped-mastery model, in which students move through the material at their own pace. No longer do all students watch the same video on the same night. Students watch and learn in an asynchronous system where they work toward content mastery. We should note that we did not start using the flipped-mastery program until two years after abandoning the traditional model. Our journey has been a process that has occurred over several years, and we recommend that those interested in flipping make the change gradually. Copyright © 2012 by International Society for Technology in Education. All rights reserved. No part of this publication—including the drawings, graphs, illustrations, or chapters, except for brief quotations in critical reviews or articles—may be reproduced or transmitted in any form or by any means, electronic or mechanical, including photocopy, recording, or any information storage and retrieval system.